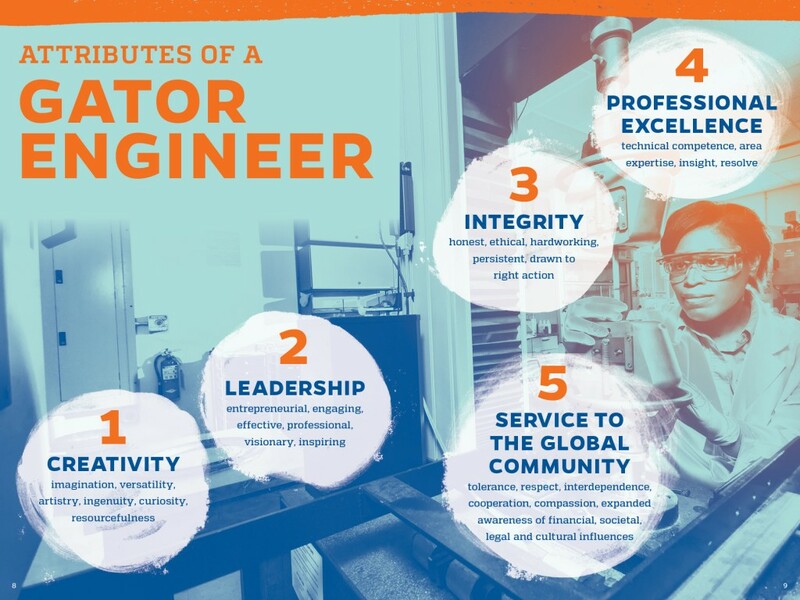 Established in 2010 as part of the Herbert Wertheim College of Engineering’s centennial celebration, the Attributes of a Gator Engineer embody the college’s expectations of all students and faculty. Awards are bestowed upon the undergraduate students and graduate students who best represent each quality. Read on to find out more about the attributes, and ways our college helps support and develop them in our students and faculty. Gator Engineers have imagination, versatility, artistry, ingenuity, curiosity, and resourcefulness. Click on the links below to see how that creativity comes to life. The digital arts and sciences program crosses college boundaries between engineering and fine arts. This degree is an interdisciplinary engineering program. The Innovation Academy at UF is a groundbreaking academic program that fosters creative thinking, entrepreneurship, leadership, and innovation, giving students the tools to be successful in a competitive, 21st century economy. The interdisciplinary nature of the program allows students from over 30 different majors to collaborate, earning one common minor: Innovation. The University of Florida Engineering Innovation Institute fosters a culture of innovation among faculty students and staff of the Herbert Wertheim College of Engineering. It serves as a nexus for education programs that explore the spectrum of creative discovery and invention, and aim to prepare UF students and their technologies for the marketplace. Throughout the Herbert Wertheim College of Engineering, there are many opportunities to participate on design teams, collaborate with other students and use resources to bring your idea to life. Some of the design teams include Gator Motorsports, SolarGators, AeroGators, UF Student Quarter Scale Tractor Team. The Herbert Wertheim College of Engineering also offers students access to 3D Printing labs. Gator Engineers are entrepreneurial, engaging, effective, professional, visionary and inspiring. Click on the links below to see how that leadership comes to life. The University of Florida Engineering Leadership Institute focuses on creating leaders for a new world, where technology plays a major role and the need for principle-based, character-focused leaders is now more than ever demanded by our country and the world. At this year’s summit, the Engineering Leadership Institute hosted discussions on the role of women and diversity in leadership. There are currently 51 undergraduate and graduate student societies in the council, including many UF chapters of national organizations. The Benton Engineering Council (BEC) was established in 1910 to serve as the executive and legislative coordinating body for the students and organizations in the Herbert Wertheim College of Engineering. Gator Engineers are honest, ethical, hardworking, persistent, and drawn to right action. Click on the links below to see how that integrity comes to life. Engineering Ethics and Communication is designed to introduce engineering students to the concepts, theory and practice of engineering ethics and effective written and oral communications and presentations. Students apply classical moral theory and decision making to engineering applications encountered in academic and professional careers. In adopting this Honor Code, the students of the University of Florida recognize that academic honesty and integrity are fundamental values of the University community. Students who enroll at the University commit to holding themselves and their peers to the high standard of honor required by the Honor Code. Gator Engineers have technical competence, areas of expertise, insight, and resolve. Click on the links below to see how professional excellence is part of everything we do. The Herbert Wertheim College of Engineering at the University of Florida has 11 degree programs accredited by the Engineering Accreditation Commission of ABET. ABET is the recognized accreditor for college and university programs in applied science, computing, engineering and technology and is among the most respected accreditation organizations in the United States. UF is Top 10 nationally in total STEM degrees awarded. UF is Top 10 nationally in total STEM degrees awarded to minorities. UF is Top 10 nationally in student enrollment in engineering-related degrees. The Herbert Wertheim College of Engineering research enterprise is one of the largest and most diverse university portfolios in the U.S. Research activities range from developing some the world’s fastest computer architectures, to designing materials that self-heal, to developing biomedical technologies that image epileptic seizures. With a faculty size in excess of 260 tenure/tenure track members, research expenditures from external sponsored research is in excess of $63 million and growing. The University of Florida and the Herbert Wertheim College of Engineering work with the Career Resource Center to educate and create connections for the University of Florida community in order to facilitate the holistic career development of students. Gator Engineers have tolerance, respect, interdependence, cooperation, compassion, expanded awareness of financial, societal, legal and cultural influences. Click on the links below to see how Gator Engineers provide service to the global community. Founded in 2005, The University of Florida Gainesville Chapter of EWB-USA works alongside a team of experienced faculty mentors and professional engineers to tackle the needs of communities all around the world. Students are also involved in various educational and community ventures. Involvement in the club is not solely limited to those who work on out-of-country projects.Contact any of us to see how you can get involved. All disciplines, majors, and backgrounds are welcome. Engineers’ Week at the University of Florida is a two-week celebration, hosted by the Benton Engineering Council through UF’s Herbert Wertheim College of Engineering, that aims to recognize engineers’ contribution to modern social development through a series of fun, interactive, and informative events. While Engineers’ Week aims to celebrate engineers, the events also underscore the relationship between engineering and all other fields of study, from fine arts and journalism to liberal arts and social sciences. Engineers’ Week at the University of Florida began in 1945 with the Engineering and Science Fair (E-Fair). E-Fair today is a two-day event that invites 1,500 elementary, middle, and high school students from all parts of Florida to participate in Engineers’ Week through campus tours and interactive activity booths showcasing students’ success and achievements as Gator Engineers.